Designed for expeditions, the Shell Pro Full-Leather Mitten from The Heat Company, in size 8, is their warmest outer shell and provides the greatest protection and heat retention to keep vulnerable hands and fingers warm and protected from the harshest elements. 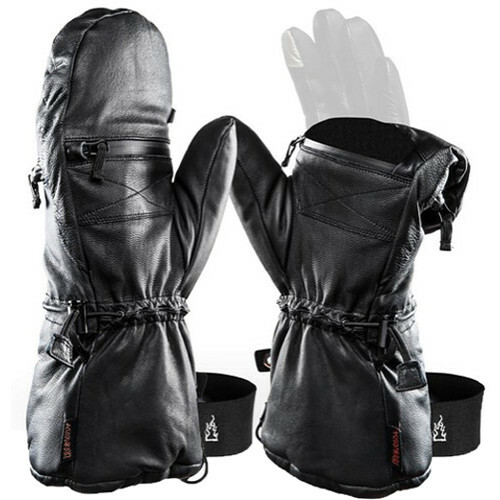 Constructed from tough but soft and supple goatskin leather, these mittens are lined with warm and comfortable Primaloft Gold insulation. When you need to use your fingers to operate a camera, access your phone, check your stats on a sport watch, or perform any one of a thousand tasks, simply fold back the finger's mitten flap to expose your digits. A magnetic clasp keeps the flap out of your way so it won't interfere with what you're doing. For added protection without sacrificing dexterity, layer the mittens over a pair of available liners. There's an adjustable cinch at the wrist and extra-long closing cuffs that stay in-place on your forearm to keep snow out. You can slip a disposable hand warmer into the small zippered pocket on the back of the hand, or use it to stow other small accessories like credit cards and IDs. Thanks to the leash and elastic wrist strap, you won't lose the gloves if you need to pull off the whole mitten. A container of Heat Leather Balm is provided to keep the leather soft and supple. The size 8 mitten fits hands 7-7.8", measured around the palm of your dominant hand just below the knuckles. The Heat Company recommends sizing up if you are in between sizes.